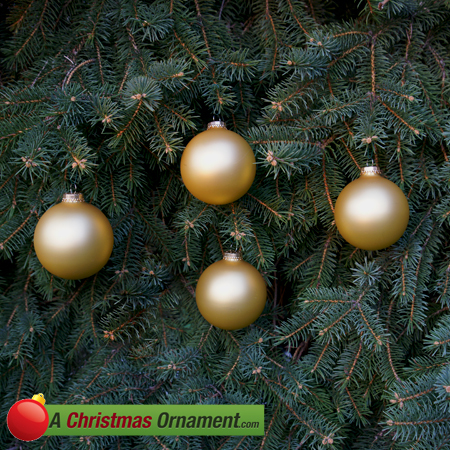 Christmas Ornaments Made in USA - Gold Velvet Glass Ornament Balls - Set of 4 - A Christmas Ornament Co. The modern-day Christmas ornament came to be In the middle ages, when Venetian traders brought the 4000 year old art of mouth blowing delicate art glass to the northern village of Lauscha, Germany. Master artisans created beautiful glass ornaments to the villagers' homes and Christmas trees. Childhood memories abound with these glass ornaments, which were around many years before the advent of plastic Christmas balls. Many of us can remember sitting by the fireplace as children as mom and dad decorated the Christmas tree with all manner of baubles, decorations, ornaments, lights, a tree-topper ... these are the things very special childhood memories are made of, and these ornaments are a return to a simpler and happier time.